Equipment housing for telecommunications and power companies is a critical component of both industries. New housing and emergency maintenance requires a reliable and cost-effective product that can be up-and-running quickly. The chosen product should also be resilient, to save time and money on maintenance and repairs. This begs the question… which material will provide optimum service in the least amount of time: steel or concrete? Using prefabricated steel accelerates scheduling on a project. Unlike concrete, prefabricated steel requires less on-site construction. In fact, prefabrication methods cut the steel erection time on a project by 40 to 50%. This technique uses integrated 3D modeling during the design, detailing, and fabrication processes to construct the building quickly. Additionally, it creates room for other trades to work more safely in newly-erected structures. Steel framework is up to 60% lighter than a reinforced concrete frame, which equates to a less expensive foundation. Often, the removal of a single steel member leads to exponential modifications as well. With concrete structures, vertical elements elevate cutting times and costs. Hybrid solutions can streamline construction. Precast concrete reduces the build time on a project, where innovative formwork, like self-climbing forms, adds to the efficiency of construction. Fibrebond has been developing innovations in manufacturing for more than thirty years, using both concrete and steel. To reduce cost but not quality, Fibrebond has perfected the manufacturing and construction of steel and concrete hybrid structures. Fibrebond’s manufacturing facility utilizes LEAN manufacturing principles to reduce waste in both labor and materials. Fibrebond seeks to eliminate waste and decrease the cost of projects by pursuing optimum efficiency in design, fabrication, and quality. Our manufacturing standards and hybrid structures support this pursuit. ASTM, UL, and building codes use fire-resistance ratings to measure the fire containment effectiveness of structures. The rating classifies a structure’s isolation ability in a zone comprised of a fire-resistant rated wall, ceiling, and floor assemblies. Fire tests determine at what rate fire can raise the temperature above maximum levels. A Class 125/ 2 Hour rating requires that temperatures inside the protected chamber be held below 125 °F (52 °C) for a specified time, with temperatures up to 2,000 °F (1,090 °C) outside the vault. Maintaining a temperature below 125°F is critical because data is lost above that threshold, even if the media or hard drives appear to be intact. The protection of microfilm, microfiche, and other film-based information storage media requires a Class 150 rating. Above 150°F (65.5°C) heat distorts the film and destroys information. A Class 150-2 Hour vault must keep the temperature below 150°F for at least two hours, with temperatures up to 2,000°F. (1,093.3°C) outside the vault. Steel: A 2-hour rating requires gypsum board inserts and batt or rock wood insulation to supplement wall thickness and weight. Concrete: A 2-hour rating is achieved with the installation of 4” solid concrete walls, with inserts of specialized gypsum board and insulation, such as in steel construction, to reduce the overall weight. Though Fibrebond electrical systems are reliable, some components will require maintenance or testing during the life of the structure. Fibrebond ensures compliance with the standard NEC requirements to allow safe and efficient access to electrical equipment after installation. Steel: Conductive material on wall—NEC Aisle. Clearance Condition 2. Concrete: Non-conductive material on wall—NEC Aisle. Clearance Condition 1. Condition 1 applies either when there are exposed live parts on one side of the working space or when there are exposed live parts on both sides of the working space that are effectively guarded by insulating materials. For Condition 1 installations with voltages to ground up to 600 volts, the minimum clear distance is 3 feet. Condition 2 applies when there are exposed live parts on one side of the working space and grounded parts on the other side of the working space. The code explicitly states that concrete, brick, or tile walls shall be considered as grounded. For Condition 2, installations with voltages between 0 and 150 volts, the minimum clear distance is 3 feet. For voltages between 151 and 600 volts, the minimum clear distance is 3.5 feet. Steel: Standard warranty is one year. Concrete: Warranty with standard elastomeric membrane roofing is 10. 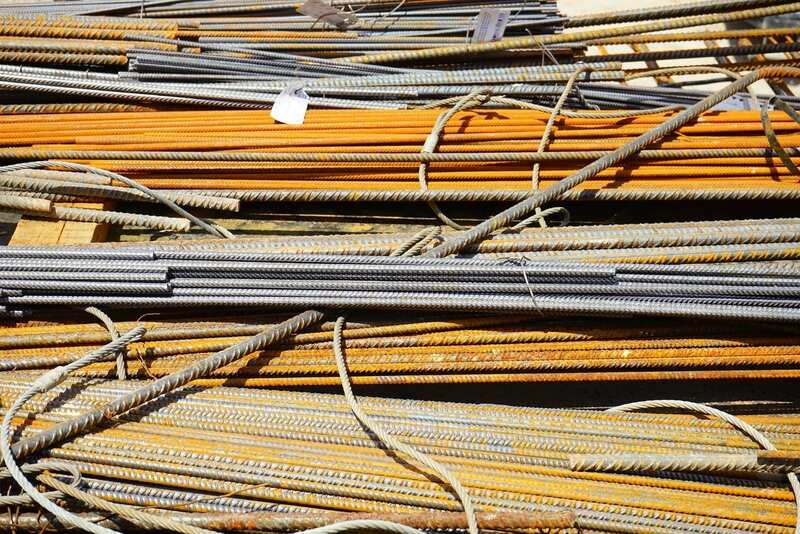 Steel: Mixing steel and concrete components for the base, walls, and roof is effective for certain specific applications, particularly when the weight is a critical factor. Concrete: Mixing steel and concrete components for the base, walls, and roof is very effective for certain specific applications, particularly when the weight is a critical factor. Time, cost-effectiveness, efficiency, and reliability are the primary concerns in the equipment housing industry. 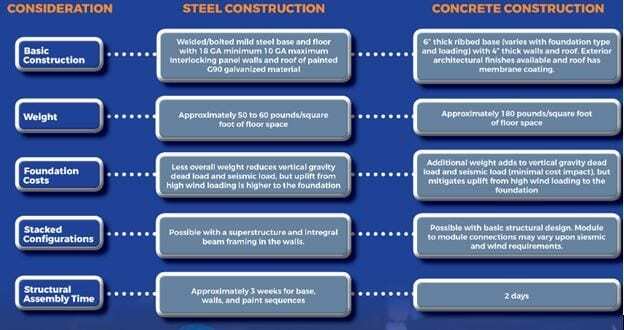 Both steel and concrete constructions have unique advantages and limitations in various scenarios. Hybrid designs incorporate the best of both worlds, and may be the most innovative solution on certain projects. Fibrebond’s manufacturing facility concentrates on production that utilizes LEAN manufacturing principles to provide timely delivery of a superior quality cost-efficient precast building. With one of the world’s most sophisticated concrete plants, as well as a complete metal fabrication shop, we can stand by the reliability of our constructions. At Fibrebond, we aim to exceed customer expectations. We complete thorough inspections to ensure high standards of concrete and steel during each phase of production. Fibrebond also offers design development engineering and logistical services.